San Marco Giardinetti is the larger and newer of two waterbus stations near the Piazza San Marco (the other, S. Marco Vallaresso, is a few meters to the west in the satellite image above). The station has a ticket booth for ACTV and Alilaguna, plus an ACTV ticket machine. 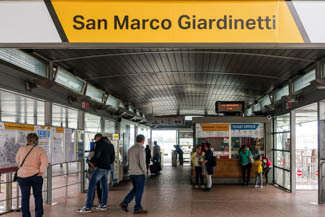 The former Royal Gardens are just behind San Marco Giardinetti, which has a ticket booth and an ACTV ticket vending machine. If you're departing, pay attention to the electronic signs in the station and the numbers or letters on the boats.